UniDict is an unification mod. When we play modded Minecraft, several mods based on their progression add Copper, Tin, Silver, Lead... But since a lot of mods add these common resources, we start to have a lot of equivalent items. This "issue" could be solved manually through CraftTweaker, but since there are a lot of machines and resources, it can quickly become boring, and CraftTweaker doesn't give the you the ability to modify everything. Would it not be easier do this automatically? 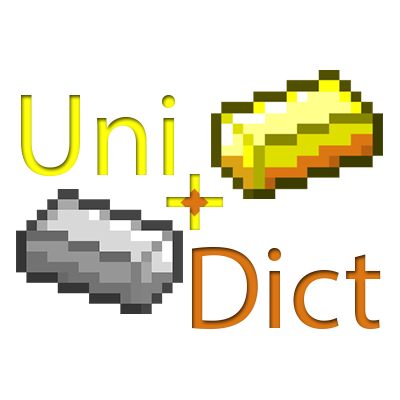 This is what UniDict does, it standardizes the output of all recipes (that it has Integration with), not just for crafting table recipes, but for a lot of machines throughout several mods. UniDict does not unify Ore Generation. for more informations about UniDict, checkout our Wiki. checkout the first, and probably the last, UniDict Spotlight, made by ShepherdShang. looking for Integrations for older Minecraft versions? checkout this Wiki Page. Indirect integrations: Tinker's Construct, Furnus, Extra Utilities, Actually Additions, Mariculture, and probably a lot more. check out InstantUnify, it instantly unifies dropped items, and it is compatible with UniDict. I love UniDict, how can I Support it? Are there plans of adding support for nuclearcraft in 1.12.2? especially the alloy furnace. is there any way to auto unify items I've registered to the same oreDict? It's not listed in the wiki if there is. sorry for the delay, for now, no, you have to do it manually. check the topic "Crafttweaker Support" on the wiki, there is a way to remove recipes. CraftTweaker remove recipes way before UniDict creates the new ones. so, in order to remove "by UniDict" recipes, you must use the "S:recipeToRemoveList" config option. it works, but the only problem is that UniDict CraftTweaker support is intended to affect all recipes of a given "kind", so, trying to remove just Steel Ingot with it, will result in the removal of all ingot recipes. in our server modpack, we use unidict to fix ore dictionary problem but with forestry and natura it act weird. when we try to make natura and forestry stick it give us default minecraft sticks. this blocks us from crafting fence gate/fence from that wood. can it be fixed in the config or do we need to use a mod(like craft tweaker) ? Hi guys, i just saw on the Ender IO Curesforge page, that the new Ender IO Release for 1.12.2 does not work with unidict. I don't know what the problem is, but maybe you could take a look. I will take a look on EIO soon. Can this mod fix the output of seeds/essences in Mystical Agriculture using Immersive Engineering Cloche via RF Tools' Crafter? Tried to check and ask Myst Agri and it seems they suggest to try your mod but haven't tried yet. Best mod ever, goes in every pack that has multiple types of the same resource. EDIT: posted to fast the issue with the broken "Forge Hammer" from IC2. sorry for the delay, fixed on 1.12.2-2.4c. I'm finding that interactions with Ex Nihilo Creatio is a bit odd, such as crafting to get the chunks results in getting the actual ore blocks except Aluminum cuz Aluminium weirdness as always. Could you add integration to prevent this?